An unemployed Vivaan (Rajeev Khandelwal) and his wife, Siya (Tena Desae), are making their ends meet when they win a contest to travel to Fiji. 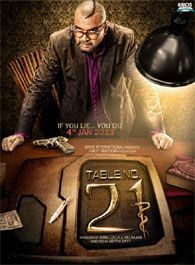 There they meet Mr. Khan (Paresh Rawal), who invites them to take part in his live game show, Table 21, which offers a staggering cash prize. They need to answer 8 questions about their personal lives truthfully and then do tasks related to these questions. They start the game and at first it's easy, but soon it becomes a horrendous game. awwwesome movie & gr8 performance by Rajeev. yet to see the movie but will surely watch it. This will be good. Waiting for the review to come. Can't wait for this movie..
Movie Review : Samrat & Co.